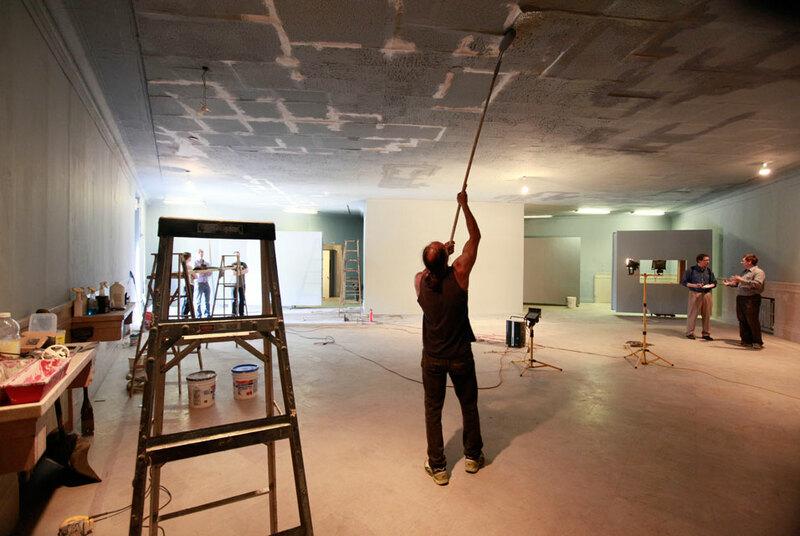 Volunteer Al Hughes paints the ceiling at Kunsthalle Detroit, International Center for Contemporary Art in Detroit, Monday, May 23, 2011. A Russian-born art consultant wants to restore Detroits status in the art world by drawing artists to an unlikely place. Tate Osten is the director of a nonprofit group that spent $60,000 on a century-old vacant former bank building in a blighted, crime-infested section of the city. If it takes root, she hopes galleries and other businesses follow, potentially transforming the downtrodden area in the same way art houses famously changed the Chelsea and SoHo neighborhoods of New York City. AP Photo/Paul Sancya. DETROIT, MI (AP).- A nonprofit group is trying to restore Detroit's status in the art world by drawing artists to an unlikely place: a century-old former bank in a neighborhood so infested with crime that some of the building's pipes were stolen and its windows riddled with bullets. If the museum takes root, organizers hope galleries and other businesses follow, potentially transforming the downtrodden area in the same way art houses famously changed the Chelsea and SoHo neighborhoods of New York City. Tate Osten, a Russian-born art consultant, and a group of volunteers have spent months rehabbing the old Detroit Savings Bank branch and are days away from opening their first exhibition. Their group, called Kunsthalle Detroit (pronounced KOONST-hah-leh, or German for "art hall"), aims to improve the city not only aesthetically, but economically. "Such a metropolitan city as Detroit has to be on the cultural map of the world like it was 100 years ago," Osten said. "And that's basically what triggered me and my friends and colleagues to put our minds together to create this institution." A decades-long exodus has left Detroit with hundreds of vacant structures, which have drawn out-of-town artists seeking what they regard as a blank canvas. But this canvas is heavily blighted, too. Waist-high grass fills the abandoned lot across the street. The few nearby buildings being actively used include a junkyard, an auto shop, a church and a grocery store with a roof encircled in barbed wire. Detroit's skyline towers in the distance. A few steps from an entrance to the main exhibition hall is a bus stop where, on a recent day, a man waiting for his ride ambled around the side of the building and relieved himself against a back wall in plain view of the street. "It's a bad area," Osten acknowledged. "We pretty much cannot take the graffiti off (the exterior of the building), because it was painted by local gangs. I've heard very bad stories. Every now and then, we hear a shooting. I had guys approaching me who would advise me not to be here in this area without a gun." Thieves broke in about a year ago and swiped video projectors, DVD players and tools. Despite the setbacks, Osten believes this is a good location and that most passers-by are just curious about what's happening inside. The museum has installed a surveillance system and will bring in security guards for its inaugural exhibition, which is to open Friday. It includes works from about a dozen artists, including Sebastian Diaz Morales and Hans Op de Beeck. Painter Donald Cronkhite, who lives in the suburb of Allen Park, said Osten's effort is exciting because "someone is realizing the need for a place like this and is willing to take a chance putting it in Detroit." In the past, "many artists felt like they had to leave Detroit and to go to New York or Chicago in order to make it in the art world, but the artists are coming back." Many of them are buying vacant homes and renovating them for studio space. Beginning in the 1960s, SoHo drew scores of artists who turned the forgotten industrial wasteland into a creative mecca. In the years that followed, some of the nation's most influential contemporary artists lived there. Chelsea made a similar transformation of its own, changing from a district known for factories and warehouse piers to a hub for art, with hundreds of galleries. Osten's fledgling nonprofit museum is not far from the 125-year-old Detroit Institute of Arts and about the same distance from the Museum of Contemporary Art Detroit, which opened in a gutted former Dodge dealership in 2007. She believes the art hall will succeed because of the city's tremendous potential, its wealth of available space and "young energy." Although the project is not designed to make money, Osten hopes it will be a catalyst for improvements. She wants to transport "elite art into the raw ground" and expose it to an audience that "might never in their lives travel outside of their neighborhood." Osten knows the international contemporary art scene well, having worked first for billionaire financier George Soros' Open Society Foundations in St. Petersburg, Russia, and later in New York as a project coordinator and consultant who put together collections for corporate and private clients. She's also a classically trained ballerina who served as the director of a ballet museum for seven years. In May 2009, she caught glimpses of Detroit's physical devastation on TV. Never having set foot in the city, she knew only about its heritage as an automotive capital and that it had "some trouble in the '60s." She rented a car and drove from New York to Detroit. What she saw made her cry and affirmed her belief that "something had to be done." So she and her husband moved here permanently in July of that year, buying a 2,400-square-foot home in the city's Boston Edison neighborhood for $27,000. "It was stripped of everything," said Osten, who then formed Kunsthalle Detroit and set about searching for the group's home, which was leased last winter for $60,000. Kunsthalle Detroit gets by through private donations. It shares the same name and spirit as other kunsthalle locations around the world that Osten hopes to collaborate with in the future. It has no plans to sell any of the art it displays and intends to charge only a small entrance fee in the form of a suggested donation. Osten has sold personal jewelry and clothing to pay off expenses. She searches Craigslist for tools that might help with the various construction projects. While she has grand plans of buying up abandoned buildings across Detroit and setting up a system of satellite art centers, she's focused for now on making the first space a success. "This is just the beginning," she said. "The change begins with one."